By Sunday afternoon, my feet were just as swollen as they were after the 2012 Susitna 100 — which is to say, very swollen. I didn't take a photo like I did last year, but you can really only take so many pictures of sausage toes before they all look the same. I'm really not sure why this only seems to happen to me during winter ultras. I ran several long races during the summer — sometimes in very wet (UTMB) or rapidly fluctuating hot and cold (Bear 100) conditions — and did not experience anywhere near this level of edema. It's a puzzling mystery. I did try to take precautions to avoid skin maceration and swelling. My shoes were GorTex Montrail Mountain Masochist, sized 1.5 sizes too large to accomodate extra socks. Because of the "warm" forecast, I opted to go with two layers of DryMax socks: a trail sock and a larger winter sock — mostly to fill out the shoes, but I expected the socks would move the moisture away from my skin like they do in summer runs. I did wear gaiters, which were in hindsight not needed, but you never know when you're going to have to wade through softer snow and I didn't want to get snow down my shoes. On top of all that, I slathered both feet in Hydropel the morning before the race. Hydropel is an anti-blister ointment that repels water from skin. The company discontinued production last year and Beat bought up every last remaining tube at Zombie Runner at the time. He gave three to me, and I treat it like liquid gold these days. Used only in races, and even then, only the most foot-shredding races. But by the end of the Homer Epic, my heel and forefoot on both feet were bright white, deeply creased, and painful. When I took my shoes off on the trail, I convinced myself they were full-scale huge blisters. But no, it was just maceration, or the colloquial version of "trench foot." After the skin dried, my feet swelled significantly. Anyway, if anyone has some insight into this condition, I'd appreciate any tips or advice. Winter running is a strange animal. But yes, my feet hurt a lot after the race. Beyond that, however, I didn't feel too beat up from the Homer Epic. I took Sunday off to catch up on chores and communications, and doze off in my car at scenic overlooks for an hour here and there. On Monday, the weather remained clear and gorgeous, and I started feeling antsy again. Since I was in Homer, it made sense to squeeze in a ride on the beach. Luckily it was a "warm" day (about 32 degrees), because I could only put one thin pair of socks on my swollen feet. Even then they barely fit into my boots. Winter beach riding has to be one of the more meditative activities there is. Waves are lapping on the shore, waterfalls are encased in ice on the bluffs, and wheels glide over smooth sand in organic lines. The sandy stretches of beach were interspersed with tight boulder fields and very loose — as in inches deep — gravelly sections. I was so desperate to not put my feet on the ground that I rode a lot more of the "chunk" than I would normally bother with, and it was a lot of fun. My still tender quads screamed as I powered over the larger rocks, but it still beat touching the ground with my hurty feet. Bikes rule. It felt so warm in the sun, and I was still so wrecked, that I opted to lie down for a nap on the sand. I spread out my coat, sprawled out facing the sun, and dozed off. 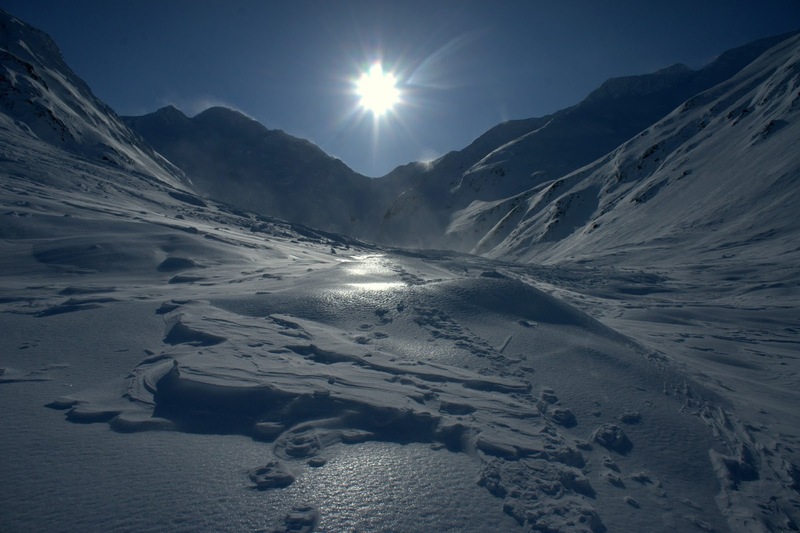 I woke up after what must not have been more than five or ten minutes, shivering and with numb fingers and toes. The beach scenery had lulled me into a sense of summertime comfort, but apparently below-freezing temperatures are not conducive to naps in the sand. In all I rode for nearly three hours with the nap, but probably only covered twelve or thirteen miles. The tide had come up a lot for the return trip and I had to ride a lot more chunk closer to the bluffs. I cleared all of it — turns out sore feet are a powerful motivator for technical maneuvering. It was sublime. I intended to get more work done while I was in Homer, but mostly I cruised the different cafes scattered throughout town, drank cup after cup of coffee, listened to K-Wave (best radio station ever) and ate gluten-free organic pumpkin muffins, kale scrambles, and vegan burritos. I'd forgotten how much I enjoy the atmosphere in Homer — it's in Alaska, tiny, but with San Francisco sensibilities. Fun place. 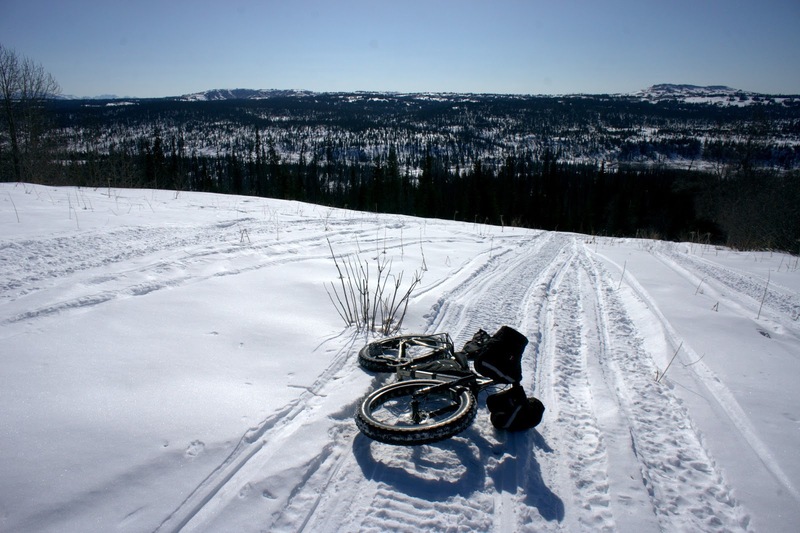 On Tuesday I decided to try Homer's snowbiking opportunities. Since I had already run a hundred kilometers of trail on the east side of town, I decided to head up to Ohlson Mountain to explore some secondary snowmachine trails. It was a fun ride, but brutal. The trail carried me all the way down to the Anchor River — losing nearly a thousand feet in elevation — and then climbed as dramatically up the next ridge on a trail that was soft, steep, and so overgrown that both of my shoulders (and my face) were continuously catching tree branches. I think bicycles sit too high for the likes of that trail. But I didn't give up on it because, well, I'm not really sure why I didn't give up. The legs were so angry with me as I churned back up to Ohlson Mountain. My quads were searing with lactic acid, it still beat pushing on my hurty feet. 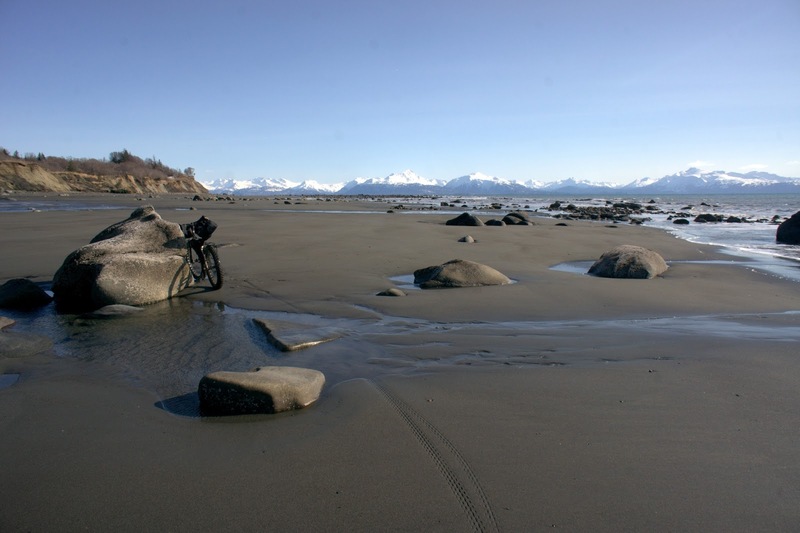 I guess if you want to ride something flat in Homer, ride on the beach. By Wednesday, the swelling in my feet had mostly diminished. I prepared to leave Homer and return to Anchorage to wrap up a couple more things. And it was yet another bluebird day. Blast! 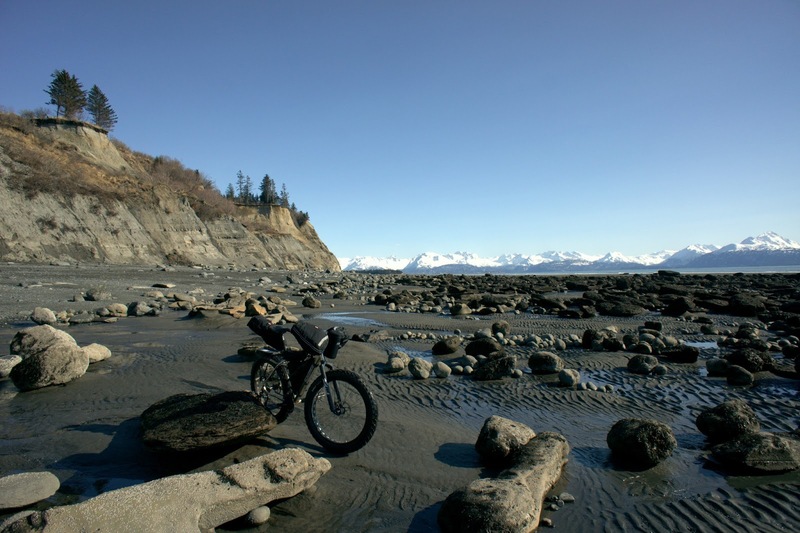 Sunny days in coastal Alaska are not to be wasted. 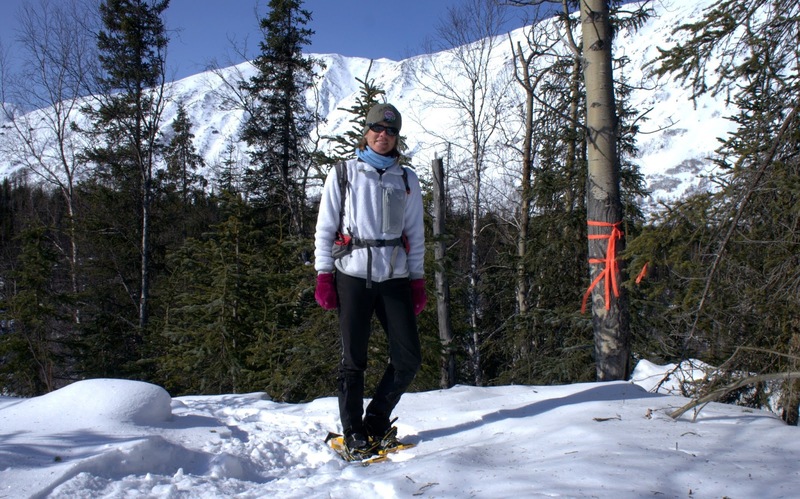 Since my legs hurt more than my feet on this day, I decided it would be a good day for some mellow snowshoeing breaks as I drove up the Kenai Peninsula. The first place I tried was the Devil's Pass trailhead, which was a bust. I wandered around in the woods for three miles and never found a "trail" of tracks that didn't loop back on themselves. At one point I discovered some survey tape and busted my own path through the brush, following the ribbons down into a drainage that had no possible link to the Devil's Pass trail. Oh well. It was still early afternoon, so I decided to stop a bit farther north and check out the Portage Glacier area. 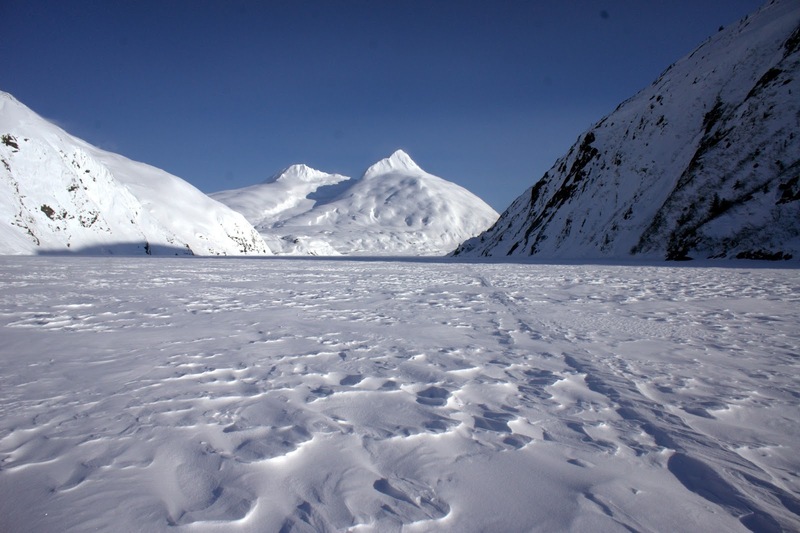 The wind had picked up significantly, and Portage Glacier has its own microclimate that instantly dropped the temperature another ten degrees. It was 13F at the parking lot. 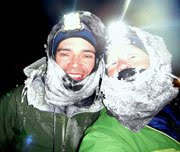 The wind was gusting to 40 mph or so, and the windchill felt awful. I almost turned around to get back in my car, but then decided the wind might provide a fun setting for a more adventurous short outing. I was not disappointed. 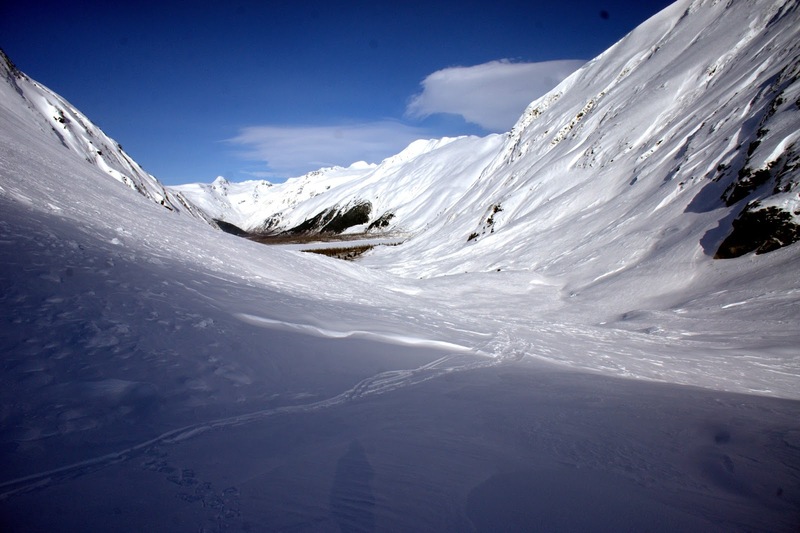 I climbed Byron Glacier in a full ground blizzard that devoured my footprints within seconds. 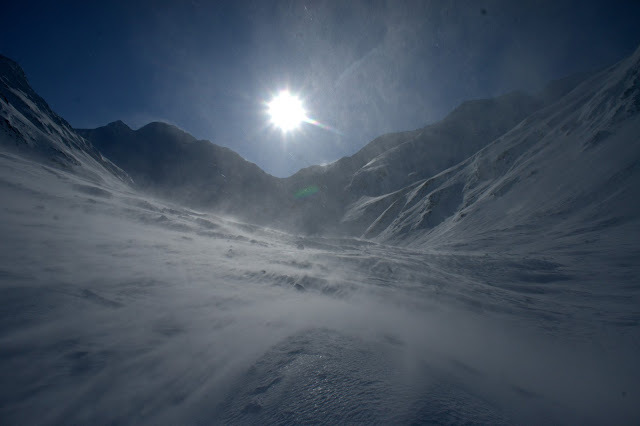 Blowing snow gave the stark landscape a kind of urgent intensity. Finally I climbed into a lee of the mountain, enough that I could look back toward Portage Lake. The wind had been entirely at my back on the climb, so it was going to be a thrilling trek down — wrapped in full-coverage goggles and facemask. I was rendered immobile and breathless whenever a larger gust roared up from the valley below. Then I decided I kinda liked playing in the wind. 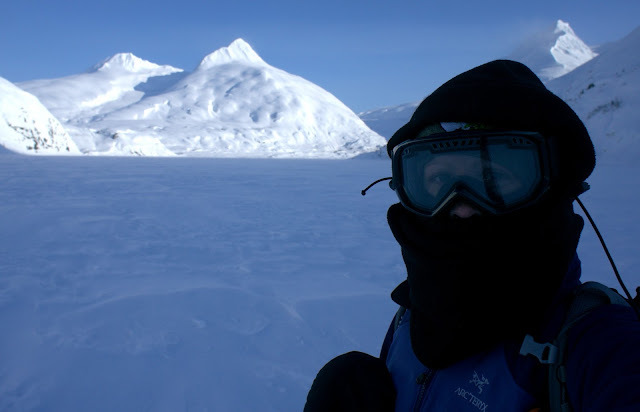 So instead of returning to the trailhead, I veered onto Portage Lake to hop stastrugi and pretend I was trekking across Antarctica. I did not walk all the way to Portage Glacier — it was a lot farther away than it looked. But I did end up with eight miles of wind-playing, and eleven miles on the day, of what turned out to be rather exhausting walking. Oi. Why do I do this to myself? Well, because it's fun. Still, I think in the end the legs and feet benefited from the shake-out. My toes look normal again, and the soreness in my legs worked itself out. Part of me is convinced this happens naturally whether one "rests" or not. Especially if one is only in Alaska for one more week, and must take advantage of these beautiful opportunities while she can. I would think that your winter foot problem is due to the cold temperatures. Kale? Vegan? Wow, homer has changed a lot! Mary — in my experience Homer has been an easy place to find hippy food for a while now. I admit I actively seek it out when I'm traveling. I begin to crave healthier food and vegetables something fierce after time crunches and convenience limitations reduce meals to boxed stuff, consumed dry and frozen. But back when I lived in Homer, I was the arts reporter for the Homer Tribune, so my time there was filled with gallery openings, wine tastings, gala events, and other happenings that seemed entirely too sophisticated for an Alaska fishing village with a population of 5,000. I'm not a doctor, but if I may make an educated guess... I'd say that's a severe case of trenchfoot well on it's way to jungle rot. It's all fun and games until the gangrene sets in.